Remember the Delightful Messenger-Only Gadgets That Failed to Conquer the World? Once upon a time, instant messaging was king. Before social media apps and smartphones rose to prominence, these free-to-use services ruled. AOL Instant Messenger (AIM), Yahoo! Instant Messenger, ICQ, you name it—everyone had their drug of choice. There was just one problem with these revolutionary methods of communication: Using them meant you needed an internet connection. That was a problem since for many people “going online” often meant stationing oneself at a desktop computer, connecting via dial-up, and tying up the phone line. As such, chat sessions had to come to a swift halt when it was time to leave the house. Today, it’s hard to imagine a world in which you can’t dash of hundreds of text messages a day, but in the late nineties and early aughts, texting technology was still new; it was expensive and rudimentary. In this milieu, instant messaging gadgets seemed like the future—imagine if you could fire off messages as you did on your computer, except on the go. Recently, while combing through some old belongings at my grandmother’s house, I came upon a couple peculiarities that brought visions of late-night gossip sessions and Dragon Ball Z role-playing flooding back to me. These were texting gadgets that I had begged my parents to purchase for fear of missing out on a night of role-play or catching up with my internet boyfriend: the Cybiko and the Motorola IMFree Messenger. After stumbling onto them during a time in my life where I’m constantly answering iMessages, tweeting, and checking out Snapchat, I was suddenly thankful that I wasn’t forced to tangle with these devices any longer to get my chat fix while on the go—which in reality meant sitting somewhere in the house while tethered to the PC. In fact, that very caveat proved to be these devices’ downfall. In the end, they couldn’t compete with phones and their cellular connectivity. Who wants to stay home when you can take the show on the road? Ultimately, none of these gadgets would last. Here are some quirky relics of a time when the world wanted to be constantly in touch, but the tech just wasn’t there yet. While this device could be used for sending messages, it was more of an “organizer” device meant for kids and teens. It obviously lost its usefulness when everyone and their brother began carrying a phone in their pocket, but for sending discreet messages to friends in class or keeping track of names and phone numbers, it was serviceable enough. These types of gadgets were a dime a dozen in the early late ‘90s and early 2000s, and weren’t anything new or special, but offered a brief glimpse into the future of how communicating primarily with text would eventually work like it does in our current society. The Secret Sender 6000 cost a whopping $119.95 when it hit toy stores in 1994. Much like Casio’s other section of organizer devices, it featured an infra-red light known as a “Magic Beam” on the device, like the IR 7000 Communicator and My Super Magic Diary JD-6500. This tech also allowed the Secret Sender to act as a TV remote control. There was no internet or cellular data required for the device to work, as it was meant more as a fun toy for kids to communicate with each other. There weren’t any additional costs involved beyond the price of the device itself, so it was one of the cheaper gadgets out there, for sure. Funny enough, despite how rudimentary the Secret Sender was and how little it could do in terms of messaging, it laid the basic groundwork for the devices we have today. This is just a really bad attempt at making the gadget seem “Japanese,” but it’s an official commercial. The Cybiko was touted as a “handheld computer” at launch in 2000, with alluring capabilities that included instant messaging, downloadable games and apps, and even its own programming language for app development known as “CyBasic.” It was certainly appealing since at the time there weren’t devices that allowed you to chat wirelessly with friends. Its gimmick? It was a two-way radio without GSM support that obviously didn’t require cell service to operate. You needed wifi as well as a working computer, though, to set it up. If you purchased a separate adapter, you could browse the internet via your Cybiko as long as you were close enough to your PC. This meant wireless internet and AIM support, which was everything I ever wanted at that age to keep up with my friends. Unfortunately, without the adapter it was limited only to other Cybiko devices in range. I was the only kid I knew in my neighborhood with the device, so “communicating” with others meant it was necessary to connect to AIM. Depending on the device you chose, you could pick up a Cybiko for around $200. The separate wireless adapter was available as an optional purchase. The CyWIG RF wireless network card was under $100 when it was first announced, but the pricey CDPD wireless modem alternative that released later was much more expensive, going for around $200 at the time. Some of the device’s shortcomings (like its abysmal keyboard) were resolved with the release of the follow-up Cybiko Xtreme, along with a slew of other improvements. But after seeing declining sales in 2003, Cybiko, Inc. ceased the gadget’s manufacture due to the one thing neither generation had: Cell phone capabilities. Though I knew it was time to move on, I’ll never forget the first taste of mobile AIM freedom the Cybiko afforded me. The Sony Clié PEG-UX50 wasn’t a texting gadget specifically, but a popular PDA that ran Palm OS. It resembled a tiny laptop computer rather than a wavy rectangle like so many of the other text-focused peripherals out there, and came packing a full feature set that dwarfed anything the other devices on this list had to offer. 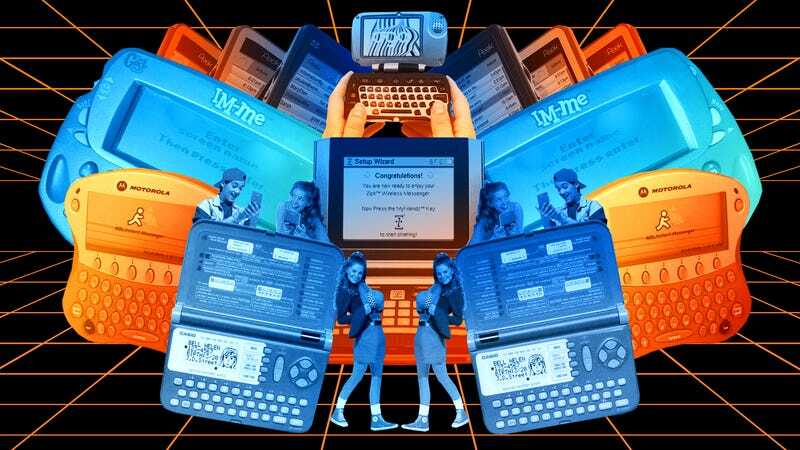 The PDA was capable of full-color internet browsing and mobile instant messaging, with a solid build and options for email, organizer functions, reading e-books, and listening to audio. It was more of an all-in-one device that just happened to handle messaging well, since it was capable of browsing to just about anything you needed—as long as it had a mobile version, of course. Of course, the device was prohibitively expensive, beginning at $699 upon release, and it didn’t pay to pick one up to rely on for simple messaging. Again, it also relied on wireless communication with the internet for any sort of browsing and chatting users might need to do, making it more expensive than investing in a desktop PC and internet in the long run. Most of the texting gadgets of the 2000s met a swift end thanks to the fact that they were essentially useless outside of the house and without a wifi connection. AT&T struck out with a different and unique plan with its hip new Ogo messaging device. Touting unlimited messaging for AIM, MSN, and Yahoo! as well as email and texting, it was priced affordably. The Ogo relied on cellular service, just like regular smartphones, when it debuted. Upon release, it was available for $99 after a $30 mail-in rebate via AT&T, with monthly cellular plans beginning at just $17.99 per month. With this plan, it didn’t need home wifi or any sort of computer to work with, which made it an attractive alternative to purchasing phones for the kids. The allure of the Ogo was the fact that it required zero contracts unlike traditional cell phone plans at the time, and it was simple to set up as well as cheap for kids and teens on the go. It offered a way to free up the home computer by letting chatters take the device with them truly anywhere they went, which helped give it an edge against the Motorola IMFree and Cybiko as mentioned earlier. Unfortunately, the device met an early end when Cingular acquired AT&T Wireless and ended the Ogo service in 2006, which meant adopters only had two full years of service before it all came to a screeching halt. For a portable device with Bluetooth, a backlit keyboard, and function as a modem, the Ogo was a formidable piece of tech. It just wasn’t released at the right time—especially when phones were really starting to take off. With mobile messaging’s popularity ramping up in the early 2000s, Motorola took the opportunity to jump into the texting gadget game. The Motorola IMFree Handheld Instant Messenger debuted in 2005, and it was much more manageable and comfortable to use than the Cybiko. The rub? It was meant solely for use with AOL Instant Messenger. The IMFree device worked as advertised, though its lack of a backlight made things difficult for night texting. Again, you were also tethered to a computer with internet access at home, meaning your conversations weren’t “truly” able to be taken on the go. If you weren’t within 150 feet of your base station, you may as well have considered the device useless. Luckily, you didn’t need a subscription to AOL to use AIM, which cut down on potential costs a bit. Further, the original asking price of $129 made the device a hard sell, especially as its singular feature made it pale in comparison to even the rudimentary cell phones available at that time. With QWERTY keyboards popping up on phones and mobile instant messaging sessions available on just about any modern device at the time, the IMFree was soon rendered irrelevant. The Zipit Wireless Messenger was happy to build upon the failures of its successors by allowing users to chat online with AOL Instant Messenger, Yahoo! Messenger, and MSN Messenger. As such, it was one of the better-received and most forward-thinking of the texting devices available in the 2000s. Out of all the wireless devices, the Zipit offered the most freedom, and some of the simplest setup. All you needed to get going was a free IM account with a compatible service and wifi, which unfortunately hadn’t yet become a mainstream convenience. At $100, the Zipit was affordable, versatile, and attractive: it came in six colors and held a two to four hour charge. It was also a step up from the other devices available at the time, allowing up to 10 simultaneous chats. Due to its small size, comfortable form factor, and utilitarian functionality, the Zipit was looked upon fondly by reviewers and consumers alike, and received the iParenting Media Award in 2005. The Zipit’s later Z2 model improved on the original in several ways, such as incorporating SMS when users were on wireless networks and went on to receive the “DigitalLife 2007 Best of Show - Portable Gear” award from PC Magazine. This one is unique in that it didn’t really “fail” per se, but simply went out of vogue as newer technology rapidly replaced texting gadgets. While the rest of the devices on this list were marketed toward teens, Mattel’s 2007 IM-Me was clearly targeting young girls and their parents, pushing the all-important “safety” narrative. Its big selling point was the fact that it only allowed users to send and receive texts with an approved list of usernames. Further, it could only be used within range of the included USB adapter, which (you guessed it) has to be connected to an internet-capable PC. Again, wifi was necessary to get this “girl-centric” device up and running. Though not a terrible idea for the time, it offered nothing but its proprietary IM setup. And while kids could happily play along with Mom and Dad’s insistence that they message only those in their parent-approved device, there was little stopping kids from hopping on the computer and playing around anyway. This pink and purple kids’ communicator worked well enough, but it was a one-note device that use wasn’t worth keeping around beyond a few years—and it’s surprising it was even around for that long, though its $65 price tag. The IM-Me’s online features were supported all the way up to January 2011, when Mattel pulled the plug on the service after four years. There’s no way anything like this would gain any sort of foothold in today’s climate, as it has zero redeeming qualities beyond its draconian parental control setup. The Peek Pronto Mobile Messaging Device took a page out of AT&T Wireless Ogo’s book, offering unlimited texting with a separate monthly subscription. Unlike several of the other texting gadgets before it, a wifi connection wasn’t required as long as you had Peek’s service, so you weren’t tethered to your computer. The Peek Pronto utilized GSM cellular service and was previously offered for $299 with a lifetime subscription service, though it had much more affordable plans as well should users choose to pay per month at $16.67 and $59 for the device. You could use five different email accounts with messaging and texting via full QWERTY keyboard. Building upon the original Peek, which was a basic smartphone that focused solely on email, the device was the beginning of a line of several devices, each with their own focus. Peek even went on to launch a special version of the gadget specifically for Twitter. The sleek and “ultra low-cost” smartphone that launched in 2009 eventually met the same fate as the rest of the Peek line, which was discontinued and all services taken offline in 2012. Peek had terminated service for its entire line, and eventually Peek exited the hardware business completely. Peek’s brief run proved that there was indeed an audience for these utilitarian devices, but ultimately the market grew up and around them, with regular smartphones continuing to rule the roost. Brittany Vincent has covered gaming, anime, tech, and entertainment for over a decade and she thinks there should definitely be an Um Jammer Lammy sequel.